There was no nomination for the additional candidate(s) which we announced on Tokyo Bulletin (No.59) issued on the August 31, 2010. We plan to resolve the election of officers and Executive Committee members which annouced on the Tokyo Bulletin (No.59) on the next Annual General Assembly. Therefore, they will assume the post of officers and Executive Committre members from January 1, 2011. 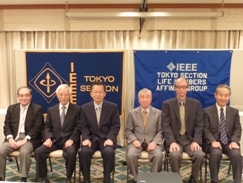 IEEE Tokyo Section Life Members Affinity Group General Assembly was held on Friday, October 8, from 10:00 a.m. at ARCADIA ICHIGAYA. The officers of Tokyo-LMAG were elected and the Action was reported. 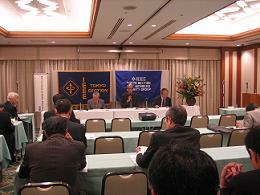 The 2010 Fourth Commemorative Lecture of IEEE Tokyo Section was held with about 50 participants at the Banquet room “Asuka” on the 4th floor in Arcadia Ichigaya on Friday October 8, at 11:00 am, after the organization meeting of IEEE Tokyo Section Life Members Affinity Group. 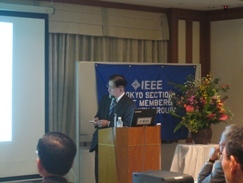 Dr. Eiju Matsumoto (IEEE Life Member), the secretary of the IEEE Japan Council History Committee, gave the lecture titled "IEEE Milestone and Experience of Technical Tour PANAMA - participate IEEE International Forum and deliver the History of Technology in Japan". He was involved to obtain certification of the Yagi-Uda Antenna (the first award in Japan). He also spoke about the acquisition know-how of the IEEE Milestone based on his experience for 14 domestic certifications. He introduced about the Panama Canal tour of the first time in which self participated and other technical tours planned by IEEE Life Members. Furthermore, there was the future plan to attract this tour to Japan.